Rasmalai , Rossomalai as also it's known as is easy, healthy and delicious Indian sweet where Ras means juice and Malai means cream. Popular Bengal sweet which is normally one step ahead of rasgulla (roshogolla). Bengali sweets are very famous whether its rasgulla, rasmalai, sandesh, kalakand and it's all favourite for most of the people. 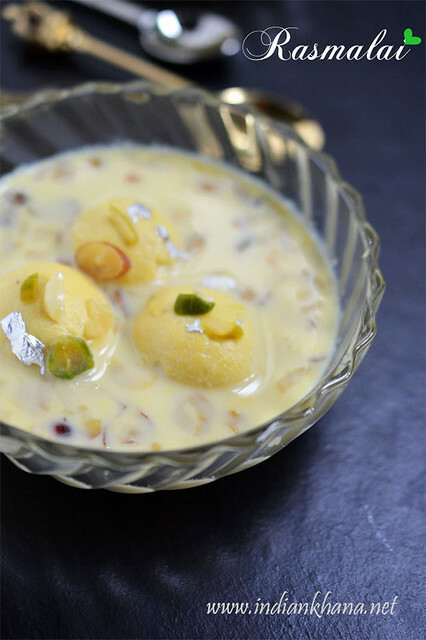 Since Diwali is approaching fast I am post yet another easy recipe Rasmalai which have option of either preparing everything at home or if in hurry we can use canned rasgulla. I have few favourite sweet rasmalai tops the chart with motichur ladoo, motipak and kesar peda, now I am left with motichur ladoo and motipak to post :) Rasmalai is so easy to prepare and it's healthy compare to other indian sweets loaded with ghee and sugar. In rasmalai we don't use any ghee and sugar is also less. 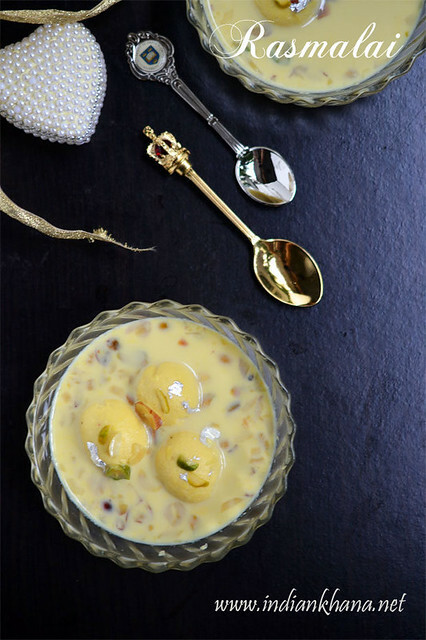 If you are looking to prepare something nice yet easy this Diwali then make these Rasmalai. Best is make large batch of rasgulla, half serve as rasgulla and half use to make rasmalai, that's all you hve two wonderful sweets to enjoy and relish. This is exactly what I normally do "Ek Thir Se Do Nishaan" as we say it in Hindi. To make rasmalai rich and beautiful looking use good quality of Saffron/Kesar and a good pinch. You can also add a pinch of yellow color while kneading the chenna, I used my rasgulla to make these rasmalai so didn't added anything in chenna and also used only Kesar to get this beautiful color. You can see the rasgulla become yellow also in inside as it's soaked well in Ras or flavoured milk. 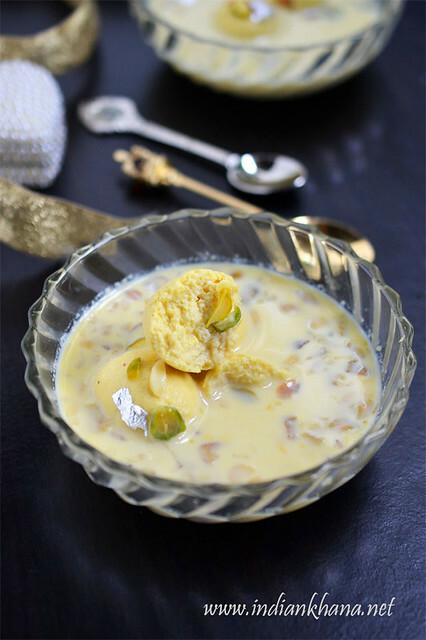 So this Diwali Rasmalai is in list :) You can also check other Diwali Sweet Recipes here. Delicious & popular Indian Sweet Rasmalai made of milk, sugar, dry fruits. Refer here to prepare Rasgulla, if in hurry you can also use tanned Rosogolla to make rasmalai. While boiling milk for Rasgulla, also heat 1 litre milk in deep bottom pan, bring milk to good boil, reduce flame and boil milk until it becomes 3/4, keep stirring milk in regular interval. Take 2 tbsp of hot milk in a small bowl and add saffron strands, soak for 10-15 mins or until required. Meanwhile slices the dry fruits. Add sugar, cardamom powder, chopped dry fruits (you can keep aside little for garnishing) and simmer milk for 3-4 mins with regular stirring. Squeeze gently prepared Rosogolla to remove excess sugar syrup and add them to milk (if using canned Rasgulla, do same gently squeeze and add to milk). Simmer milk in slow flame for 2-3 mins after adding all the Rasgulla pieces, off flame and allow to cool completely. Refrigerate the rasmalai for minimal of 3 hrs before serving. Garnish with dry fruits slivers if required. 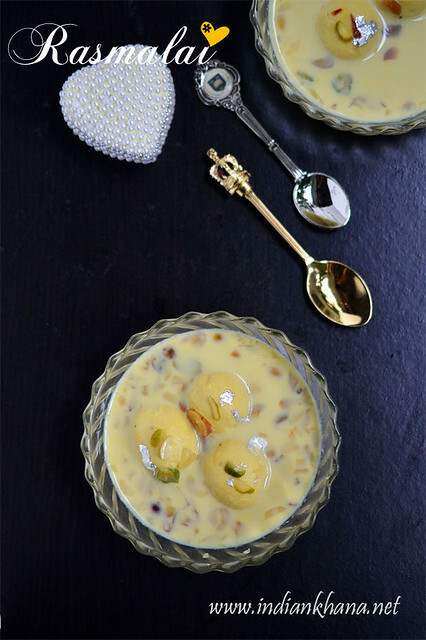 Enjoy the delicious, home made goodness Rasmalai. You can add pinch of yellow food color too, I didn't use food color, achieved this color only with saffron. 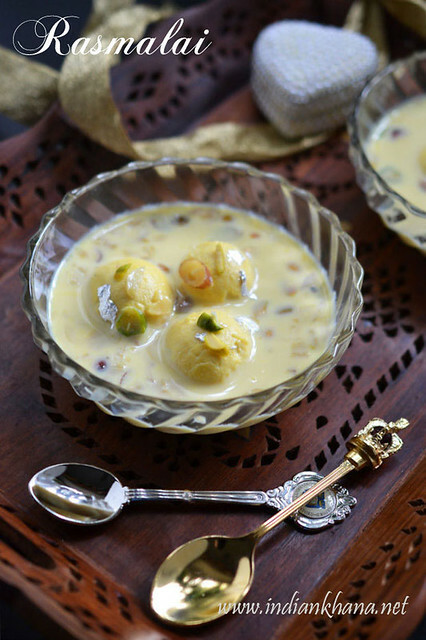 If you are making Rasgulla to make rasmalai then prepare the rasmalai milk and Rasgulla together to reduced cooking time. Make sure to knead chenna well to make rasgollua. Popular and delicious Rasmalai. Y-U-M.